Posted by Chris W in show all entries. The hit song of the week….Shoulder Knee. And here’s the one that sparked it all. We descended upon Cincinnati and the Creation Museum last weekend. Awesome game with the Saxons victorious over the Scotland A side, 36-19. Nice to see a bunch of folks with their red white blue and red rose jerseys. Gotta love the game, miss playing it. Posted by Chris W in design, show all entries. Loved the mechatronics assembly as he suits up. 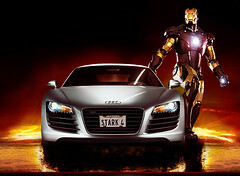 Nice styling similarity between the R8’s front/headlights and Iron Man’s mask/eye features. On a slight tangent…if some of the old school automakers would have perhaps an exchange or a cross discipline charette with creatives from other fields it would benefit them greatly. Save us from the soul-less, lumps of eye sores that ply the streets of America. Posted by Chris W in general, reflections, show all entries. ComEd said that it would be restored by this Saturday morning 11am. This is nothing compared to the many disasters that come to mind in the recent history….nothing. Candles and flashlights are our best friends…and matches of course. And of course Panera for their free wifi…of course their pick 2s were great too…the summer salads (strawberry poppy chicken and the mozarella salads) are great. So we have our Nokia phones charged up for the day and so is the MBP….we are set….until tomorrow that is. We’ll just power-hop. Little conveniences we take for granted. Gave us a chance to discover the joys of playing gin by candlelights. Posted by Chris W in general, show all entries. So they have been shooting the next Batman sequel The Dark Night around Chicago lately…in fact they have been shooting in and around our building the past week or so. A nice little excursion downstairs this afternoon to see what they were up to. Think they were just testing out the Dark Knight model/dummy. The curious crowds just kept hanging (no pun intended) around to see what else would happen. Nothing. When I was leaving work later on, they were still getting ready to shoot some scene with all the extras in position…and waiting….still no Christian Bale. Guess we’ll have to wait till next year to see the actual scene. They were also temporary laser printed signs all over the plaza at our building directing the staff to “Set”, “Breakfast” etc…that’s nice to see coming to work in the morning. Posted by Chris W in reflections, show all entries. This has got to be the best cookie fortune that I have come across in a while. Every now and then I think about the mighty moolah…the greenback, you know money $$$…kaching, cha-ching…gimme some o dat bling bling…. My thoughts tend to gravitate towards the lack thereof….or the lust for more I should say. Its funny, becos’ in my daily reading, I was sharing with Mel that verse in Proverbs about how wealth is describe as having wings like eagles…(Prov. 23:5)…interesting….sounds like someone’s trying to tell me something…. So about a year or so ago, I made an investment that would be considered very wise…yup last time I checked, the diamond’s still there…a well crafted ring. I’d like to report that the ring the diamond’s attached to, is more importantly, still attached to the person that reciprocated my investment. 1 year 1 day 11hours and 30 minutes later….we are enjoying married life more and more each day…we sleep, eat, play…do everything and do nothing together…if its not too much to say, we do everything together and we enjoy it. Its great to do the normal and usual stuff together…like going to work everyday, but what makes it better is coming home from that long work day and spending our short but sweet evenings together. So this past weekend we celebrated our first year of bliss by doing what’s most important, spending time together. We had some nice quiet dinners….on Friday we went to the neighborhood Italian place and sat outside for dinner…it was nice out. Posted by curlysue in general. Okay…so yesterday chris and I went to the American Girl store with my cousins and their little darlings on Michigan Avenue. We were in awe of the marketing scheme and how they know how rake it in…the dough that is. But i was disappointed because there were no dolls that looked like me or my dear little niece Aesha who has inherited my curly locks! I say we just boycott them altogether. Who says girls with curls are cute adorable dolls. My motto has always been…when God gives you a perm it will last your entire life…so you might as well enjoy it. chris showed this to me and i was curious…how would i rank as a world traveler? this is fun…but both of us agree our asia ranking would be higher if Singapore was one of the options!